Bamboo feeds, clothes, adorns, and can even save lives. Growing up in Afghanistan, inventor Massoud Hassani used to play in raging war zones and fields studded with landmines. He and his brother would construct small spheres from scrap metal that would roll along the desert floor, powered by the wind. Sometimes, their contraptions would travel dangerously close to the bombs. For his final project at the Design Academy of Eindhoven, Hassani drew upon his childhood experiences to create a giant version of his old playthings. Nearly 20 times bigger than the original, the heaver and sturdier Mine Kafon is made from bamboo and biodegradable plastic. Propelled by the wind, they can meander through dangerous terrain, saving lives with each mine they trigger. It has been estimated that through conventional methods, its costs up to $1,200 to remove a single landmine. Hassani’s design costs only 40 Euros, and can be used multiple times before needing to be replaced. 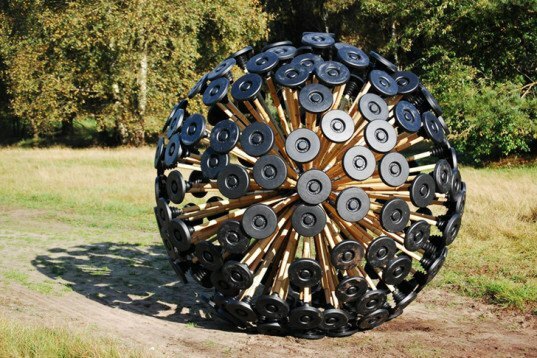 With every explosion, the Mine Kafon looses only one or two legs, allowing it to keep moving and remove up to three or four explosive devices in a single journey. He hopes to track his inventions by GPS, monitoring their paths and keeping tabs on how many bombs they clear. Massoud’s work can currently be seen at the MOMA in New York and will be shown at Gallery Slott in Paris later this year. Visit the link to see the Mine Kafon in action!